On a gloomy Saturday evening on September 8th, the Alcorn State University Braves (1-1, 0-0) hosted their first home game of the year at Spinks-Casem Stadium. The Braves entered the game after a blowout loss last week to Georgia Tech with redemption on their minds. Their counterparts, the Louisiana College Wildcats (0-1, 0-0), entered the game as heavy underdogs but judging from their pre game huddle, they were highly confident. As the game began, the Braves won the coin toss and deferred until the second half. On the opening drive for Louisiana College, Alcorn’s defense looked energetic as Solomon Muhammed was able to get two tackles including a sack to force a Wildcat’s punt. On the fourth down punt, the Braves wasted no time scoring as they blocked the punt and Alvin Wilson returned it for the Alcorn touchdown. At the 13:07 mark of the first quarter Alcorn lead the game 7-0. On the Wildcat’s second drive, they were again unable to get their offense going as they were forced to punt following a huge hit by Alcorn’s Brady Smith. On the Braves’ first offensive snap, Quarterback Noah Johnson delivered a 65 yard touchdown pass to Raidarious Anderson. The Braves then lead 14-0 four minutes into the contest. After the ensuing kickoff, LA College fumbled the snap leading to Muhammed recovering the ball and giving Alcorn excellent field position. On Alcorn’s second snap under center, Running Back PJ Simmons rushed in a 7 yard touchdown to extend the Braves lead to 21-0. After the Wildcats quickly went three and out, the Braves had the football again with a commanding lead. On this drive, Alcorn showcased a brilliant rushing attack on the heels of Simmons in the backfield. Despite the great rushing attack, it was Johnson finding Chris Blair on the end of a 12 yard receiving touchdown. With 5 minutes remaining in the 1st quarter Alcorn State lead 27-0. After a pair of punts from both teams, Louisiana College lined up with possession of the ball still trailing by multiple scores. Theron Bonds and Muhammed of Alcorn continued to cause havoc as the game entered the second quarter with the score being 27-0. The second quarter began with another Braves’ touchdown as Johnson rushed into the end zone for his third touchdown of the game. 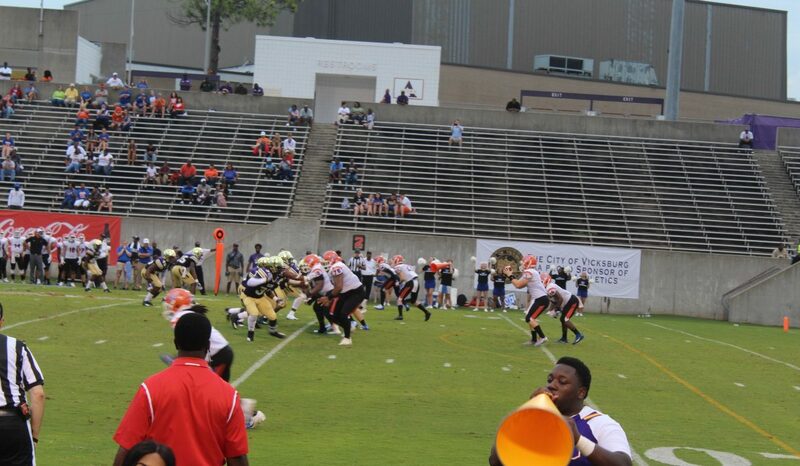 At the 13 minute mark of the second quarter Alcorn State held a commanding 34-0 lead. On the ensuing kickoff return, the Wildcats gained some small momentum as Melvin Young III returned the kick over 50 yards to set Louisiana College up with excellent field position. Regardless of the outstanding return, the Braves’ defense continued to shine as they forced yet another Wildcat’s punt. As the Braves got the football, Felix Harper entered the game at the Quarterback position. He quickly completed his first two passes but then was forced to punt after a 3rd down incompletion. Corey McCullough continued his day of kicking for the Braves with a well placed punt to give Louisiana College the football inside their own 5 yard line. After a quick three and out, the Braves marched down the field with a combination of runs and passes. After failing to punch the ball into the end zone, McCollugh was able to put 3 points on the board with a 25 yard field goal. With 7:11 remaining in the 1st half, Alcorn held a 37-0 lead. After the Wildcat’s punt, the Braves again drove down the field. With this drive Alcorn mainly displayed their passing attack with Harper under center. The drive eventually lead to a touchdown pass from Harper to Jonathan Hauer to push the Braves’ lead to 44-0. On the Wildcat’s following possession Alcorn’s Defensive Back Isiah Thomas executed a well timed interception to allow the Braves another possession. Alcorn then wasted no time converting the turnover into points as Harper delivered a touchdown pass to Wide Receiver Tarvares Johnson to close out the 2nd quarter. Despite the new half, the game just continued to spiral out of control for Louisiana College. 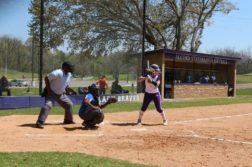 Behind strong games from a host of Braves, Alcorn was eventually victorious in an absolute blowout. The game ended with a final score of 78-0. Johnson ended the game 7-9 with 95 yards and 3 touchdowns. Harper added to the offensive totals completing 7 of 11 passes and he also added two touchdowns. Marquise Forman and Trey Turner lead the way for Alcorn on the ground with a combined 115 yard rushing performance. On the defensive side of the ball, Muhammed recorded a monster game with two fumble recoveries, a sack, and four total tackles. 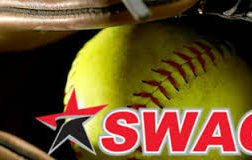 The Braves hope to continue this momentum into next weekend on Saturday, September 15th as Southwestern Athletic Conference (SWAC) play begins. The Braves will go up against the Texas Southern University Tigers (1-1, 0-0). The game will be at Spinks-Casem Stadium with a 6:00 pm start time.